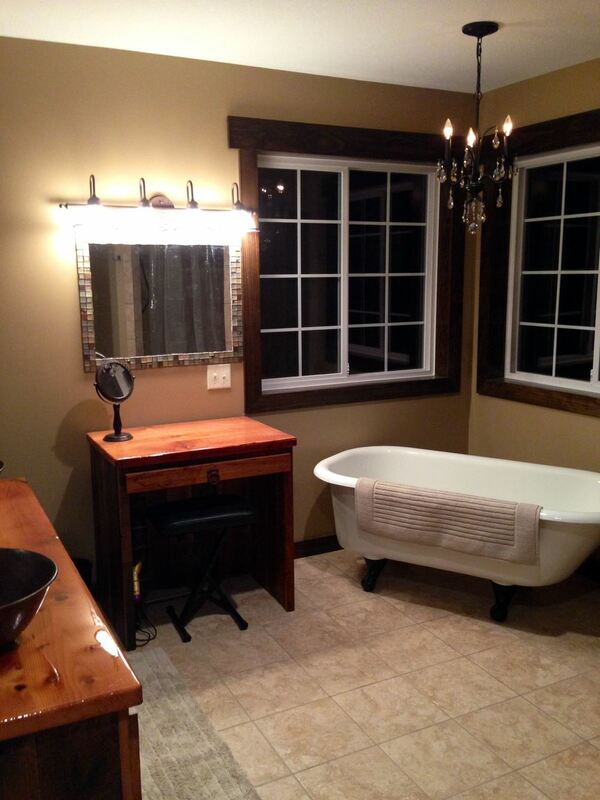 We offer the largest selection of Rustic Barn Wood Bathroom Vanities because we custom make all of our products! View the gallery below or click the button to see our other barn wood vanity designs. We can make this rustic vanity to accommodate a vessel sink or a drop in sink. When looking at the different thumbnail pictures above, many customers have asked which vanity is the abw-van1? The answer is, all of them! 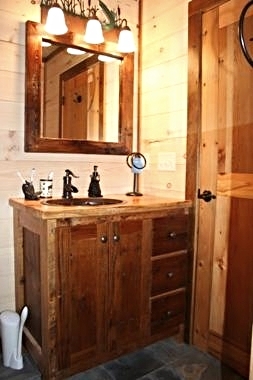 The authentic barnwood vanity, like all of our vanities, is custom. It is what ever you want it to be. The above photos are a few examples of different custom vanities we have made for customers, that can be used for reference. You can order a vanity based on these photos or you can create your own design with us. Just bear in mind that the placement of drawers must be relative to the sink and plumbing, so, for example, we can not put a fully functioning drawer directly below a sink. We can put a false drawer front however, if you like that look. It is all up to you, as we want you to have a custom piece that you helped design! The common sizes for bathroom vanities are available but we can make this in any size that you need. The height of a rustic vanity with a drop in sink ranges between 31 inches to 36 inches high depending on customer preference. The standard depth is 21 inches deep. These measurements can be easily adjusted to provide you the exact size that will fit in your bathroom. 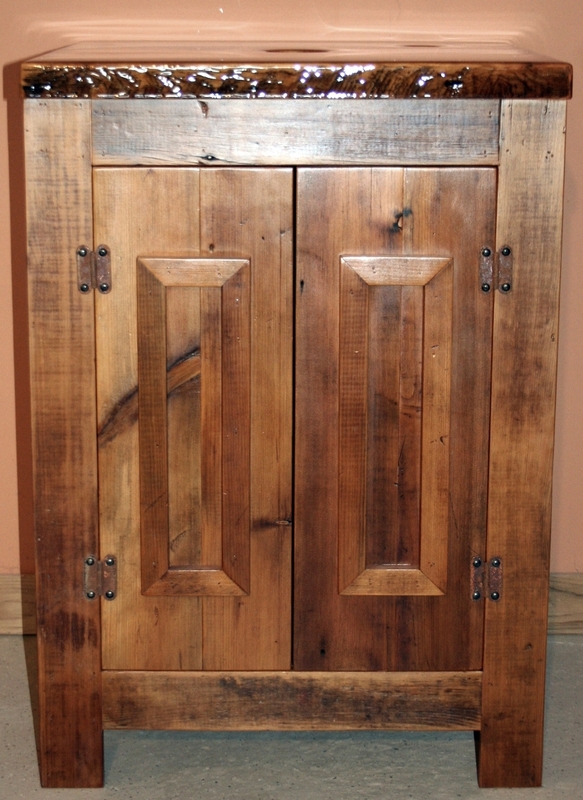 Our Authentic Barnwood Vanity is made from 100% old antique solid barn wood. We commonly see "barnwood" vanities made from faux barnwood made to look old, or made from veneers. While this can look extremely nice, we do not do this. Our wood is obtained from the Midwest, and is often difficult to find. Eventually it will be all gone and no longer available! Items pictured represent some of the diferent styles and options that are available. The wood used is primarily antique pine and douglas fir, and no two pieces of wood are alike. The color ranges from brown to amber colored tones. We do not use stain, this is the natural color of the antique wood. Of course if you want a piece stained, it is possible for us to do so. 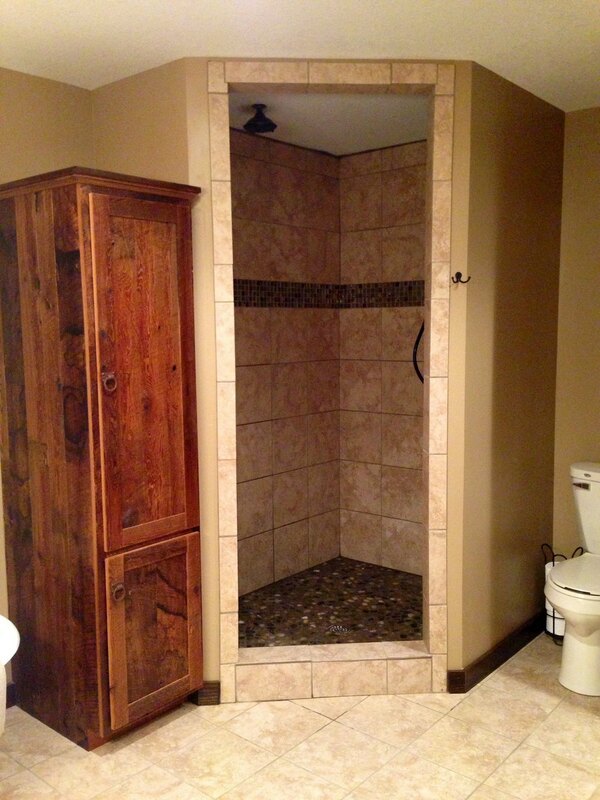 We will provide you with a quote for your specific vanity size . If you like you can click the link above to fill out a form, or you may email or call us. You may also choose a top option if you would like a wooden top. Tops are constructed from 1 3/4 think barn board planks. Standard vanities as shown come with one or two doors (depending on size). Drawers are extra and are priced at $25.00 per drawer. Dovetail drawer boxes are available for a small upcharge. Tops, sinks and liquid glass option are not included in the standard price, and are extra. Liquid glass is available on the top at an additional charge. Please select from the drop down box, or select none if you would like our standard finish. If you want your vanity to include a top, please let us know and we will include this in our quote. All Standard Tops are 1.5" thickness barn wood. Most Sinks and faucets pictured are available for purchase through us. Pulls and knobs are standard oil rubbed bronze, - please contact us and let us know if you have something else in mind and we will include this in your quote as well. Vanities are available with more options as tops, drawers, shelves and doors, with different a combination are available based on your preference. For a custom quote, please contact us! On custom orders, please call with your specifications for a quote. More examples of different styles are always being added to our website.